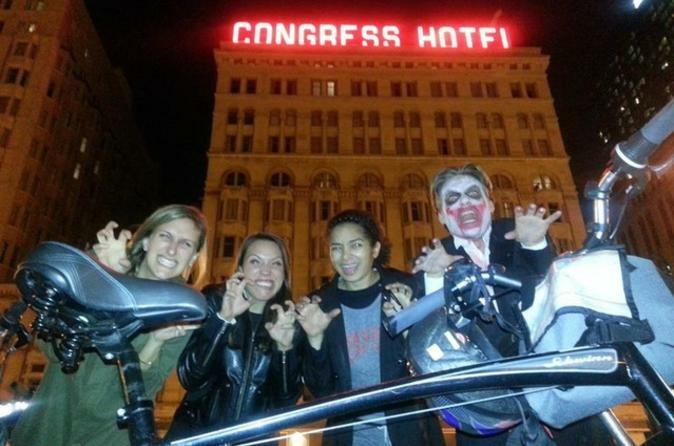 Join us we unleash our Halloween "Fright" Hike bike tour through the city of Chicago. Professional actors will guide you through the scariest stories of the city, bringing to life the most famous ghosts who still haunt Chicago today. We’ll ride through a former cemetery where thousands of bodies are buried and visit the Chicago River site where 844 people drowned in the middle of broad daylight. It is believed that one man, Charley Porter, who was on the boat when it sunk, still haunts the area to this day. We’ll discuss Resurrection Mary, Chicago’s most infamous ghost, as well as explain some of Chicago’s most notoriously haunted locales from the Levee District to the Colombian Exposition and the exploits of the one and only H.H. Holmes. Special Offer - Book Monday-Thursday through September 30, 2018 and save 20% off our previously offered price! Book Friday-Sunday through September 30, 2018 and save 10% off our previously offered price! - Book Now!